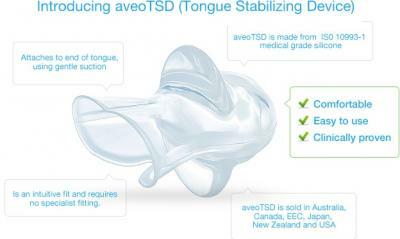 With AveoTSD tongue stabilizing device you can get a peaceful nights sleep for you and your partner - Instantly! 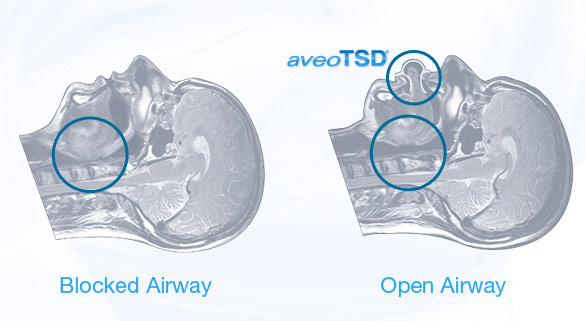 The aveoTSD anti-snoring aid which was developed by a New Zealand Orthodontist following several years of clinical research in the treatment of Snoring and Obstructive Sleep Apneoa (OSA). AVAILABLE FOR SHIPPING NEW ZEALAND WIDE. | WE DO NOT SHIP THIS PRODUCT OVERSEAS (due to customs restrictions). This simple, inexpensive and non-invasive solution to problem Snoring and Obstructive Sleep Apnoea. It stops snoring instantly by re positioning the tongue when you sleep.Prevents the progression of sleep disorder breathing which is not only annoying for your sleeping partner, it can seriously effect your health and quality of life. The AVEOtsd has been cleared by the FDA/TGA in Australia, Canada, EEC, Japan, New Zealand and the USA. Because the aveoTSD is a non-adjustable universal device it means anyone can use it off the shelf. Making it the most cost effective and simple to use snoring device. NEW IMPROVED MODEL made from 60% thinner silicone for increased comfort and a better fit. Developed over 5 years of clinical research into the treatment of Snoring and Obstructive Sleep Apnoea by Dr. Chris Robertson ( specialist in dental sleep medicine ), New Zealand. 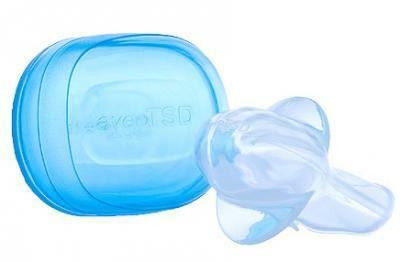 The aveoTSD is a tongue stabilizing device made from a soft medical silicone for comfort to stop the friction in your mouth that causes the snoring sound. By holding your tongue forward by gentle suction preventing it from falling back against the back of the throat, keeping the airway open during sleep. This means less noise or no noise so you can breath easy, sleep easy and awake feeling energies and refreshed. 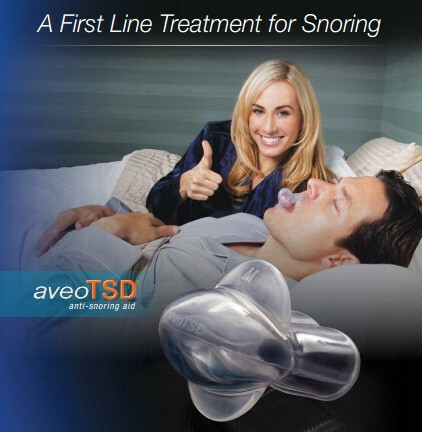 Why use an aveoTSD instead of other stop snoring mouthpeices? Unlike oral dental devices , the aveoTSD does not attach to the teeth, and does not require specialist fitting by a dental professional. What is different about the New Improved Model? Yes, it means you are aware of your sleeping problems, so you can do something about them. Snoring tells you your airways are not functioning properly as you sleep. So now you can do something to Help you health, and sleeping patterns! Snoring can effect a number effects on your health and well being. Snoring can progress into a condition known as Obstructive Sleep Apnoea, where the tongue is completely sucked against the back of the throat and blocks breathing. This can decrease blood flow and air flow to the brain which can result in a rush of adrenaline, being woken up by several large gasps to get fresh air and an increased heart rate. This can happen hundreds of time a night leaving the sleep without restorative sleep. Why can't you ship this product outside of New Zealand? So you can invest in a good nights sleep for you and your sleeping partner. Wake up feeling revived and refreshed and stop living from coffee break to coffee break. It is perfect for anyone who snores or with with mild to moderate obstructive sleep apenoa and can be used straight out of the box. 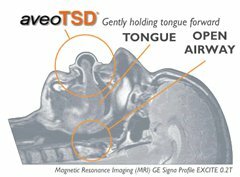 After a lot of research online into a range of products I opted for Aveo TSD because I could see clearly from the information that holding the tongue forward not the bottom jaw seemed more logical to me at keeping the airways open. Since starting to use it my snoring has reduced by 95% according to my wife and the little I do is of a low noise level. It also seems to happen when I am on my side rather than my back. Personally I feel I am having amazing sleeps now awaking refreshed after often an uninterrupted sleep and feel the turn around in my general well being is more than just coincidental. As the instructions say it does take a few nights to get used to but once accustomed I often forget I even have it in. I have bought this device about 2 weeks ago. It works for me, a "medium snorer", as I have stopped snoring during the night. I have not tried other devices but this appears to me as the least obtrusive and easy to fit. The only problem is finding the right fit. If it is to tight, it is uncomfortable. Too loose, and you will loose it during the night. This has happened a few times, but you will find it between the bed sheets or on the floor. Service from this Pharmacy is good,very fast overnight shipping between the Islands and sturdy packaging. 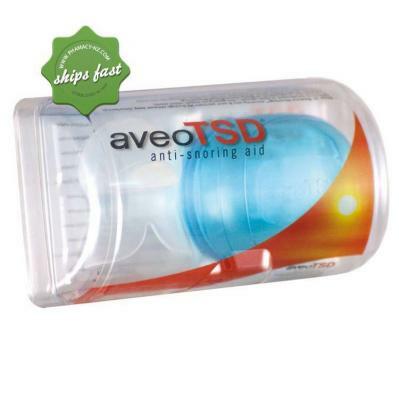 This is my second AVEO TSD Anti snoring device, the first one having given up the ghost after about 18 months - and my partner was getting frazzled at night. They take a few weeks to get used to, but are extremely effective at stopping snoring, and for the most part, completely. I have tried expensive 'dentist supplied' alternatives which just did not work (at 10 times the cost). This requires only a moderate investment, and is an effective product that takes just a little perservence to get used to. A relationship saver! A very good price for a good product. This seems to be the 2009 version of the device so it is much softer and more comfortable to use than the 2007 version. I didn't really like using the stiffer version but this one I can wear all night long. My wife thanks Aveo for making this simple device, and I thank PharmacyNZ for their promptness in supplying a replacement. WARNING, keep it away from dogs. They think it is a chew-toy. But at $125 it doesn't hurt so much when I have to replace it. At first the TSD was a bit frustrating because it kept coming off during the night, then I realized I wasn't putting it on right and since then have been thrilled to wake refreshed and well rested the next morning. Maybe my poor husband will sleep better now too. Also - great service PharmacyNZ, great communication and really quick too. excellent product for helping with sleep apoena and snoring. i use it every night and my wife can now stay in the room with me . have been using it for over 4 years and still use the same aver tsd . much better than using sleep apoena machines as i tried them for over 9 months and could not get used to the masks on my face. Having tried many other types of snoring devices this is the only one that has worked. Takes a couple of weeks to get used to it but perservere, it is amazing. My husband was shaking the house with his snoring and now he sleeps silently. He feels great after a good nights sleep. This device arrived very quickly. It works well despite a rather strange feeling in the tongue in the initial few nights. It is soft and unobtrusive unlike the mouth guard competitor. I would recommend. Most importantly it stopped my snoring.